Donald Trump isn't firing The Celebrity Apprentice, but he's bringing back the regular edition of the show with 14 ordinary job-hunters plagued by the economic crisis. NBC and Trump said Wednesday they want to put America back to work with the show, which is expected to air this fall. 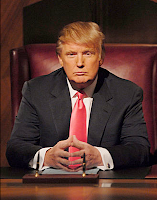 The original civilian version of The Apprentice premiered in 2004, then two years ago was replaced by The Celebrity Apprentice format. "But since the economy went down the tubes, people have been saying, 'Would it be possible to bring back the original?" Trump said. "In a way, it's more important now than when we first did it." Trump's revived Apprentice will recruit candidates who have lost their jobs, are stuck with jobs they don't like just to get by or have finished college with no offers in sight. The only common denominator: "Everybody has to be smart," Trump said. "They all have to have brain power."